WHAT PORT DOES THE CHARTER LEAVE FROM? One of the most sought-after fish in Lake Ontario, the largest of the Pacfiic Salmon, is not native to the lake They were first stocked in 1873 and became abundant 20 years ago. Their main food source is alewives. Because there are not enough spawing and nursing areas, most are hatchery-related. The largest ever caught in Lake Ontario was 47 lbs. ​Unlike the Chinook and Coho, Atlantic are not only native to NYS waterways, but were once abundant. Numerous factors contributed to their decline and efforts have been underway for the last 50 years to restore the species. Little natural reproduction occurs, so stocking is used to supplement the population. Most are between 8 and 12 lbs. Their meal of choice is rainbow smelt. 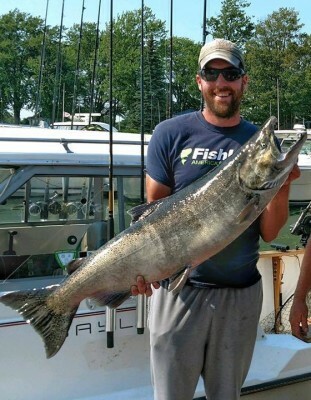 The samller cousin of the Chinook; although some have weighed over 30 lbs, the typical adult Coho is 10, hwoever, the largest Coho ever caught in the world, was caught in Lake Ontario. They have been stocked in Lake Ontario regularly since the 1960s. They feed on smelt and alwife. ​Also a native fish, some Lake Trout can live to be 20 years or more in certain waters. 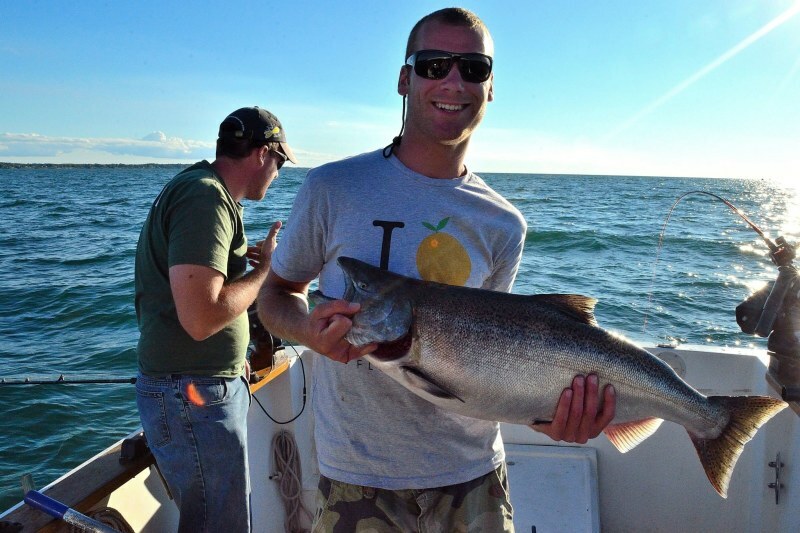 Lake Ontario Lake Trout are usually around 15 lbs but the largest caught in the state is 39. Unlike Salmon who spawn in a river, these fish spawn in the Lake. It is hoped that current stocking programs will allow this species to restore to self-sustaining lake trout populations. A popular game fish world-wide, it was introduced from Europe in the 1880s and can be found all over the state, primarily in streams but also in ponds and lakes. Fish larger than 10 lbs are common but in streams, they rarely grow to be more than 2. They are an illusive fish and a challenge to catch. Native to the Pacific coast, Rainbow trout were introduced to NYS waters in the 1870s. There are technically two types, the first, called a Rainbow, is usually only found in large streams to small to medium size lakes. The other is called Steelhead, see box to right. Rainbows are often colorful but tend to be more silvery when living in the Great Lakes. They may only weigh 1-2 lbs in streams but up to 15 in large lakes. Steelhead is a name given to migratory rainbow trout that are born in river but spend most of their lives in the ocean or Great Lakes. The two strains of Steelhead found in NY are both native to the State of Washington. They are stocked in 22 different rivers and streams in NYS. Interestingly, this species does not necessarily die after spawning and may live to reproduce several times. They are a powerful and explosive fish, very fun to fish for. Also, they are very tasty.